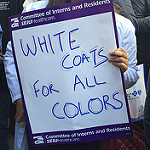 Physicians Implore Congress: #EndTheBan on Gun Violence Research! For twenty years the National Rifle Association (NRA) has campaigned against federal scientific research of gun violence by the National Institutes of Health (NIH) and the Centers for Disease Control (CDC). 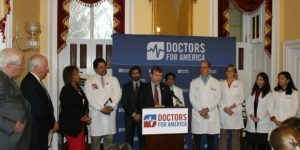 CIR leaders joined Doctors For America and a community of concerned physicians and congressional representatives at a press conference on December 2 and presented a petition signed by more than 2,000 physicians in 50 states demanding an end to the 20-year restriction. Very little progress has been made to protect our families and communities from these senseless acts of violence. Lifting the ban on research would enable federal research on many forms of violence, treating it as it should be treated: a public health issue. And it is. 89 people die from gun-related violence everyday. On December 2, hours after this press conference, news broke of the mass shooting in San Bernardino. To join the campaign to lift this ban on federally funded scientific research of gun violence, and stand in solidarity with thousands of others, add your name here.